If you want to properly maintain ledger accounts then it is necessary to record a transaction properly in active company. But did you know that if you have two active companies at the same time then you can easily record a transaction from one to another company in Tally ERP 9. If you are a novice user of Tally ERP 9 then it will not easy for you how to do this job. Most of the novice users one by one record a transaction in each company. In this guide we have to discuss how to record a transaction from one to another company in Tally ERP 9. Normally when you record any transaction it will automatically stored in the active company. But if you want to start working on more than one companies at the same time. In that situation first you must have to select more one by one more than one companies in your Tally ERP 9 software. After active more than one company you have to take few given simple steps to record a transaction from one to another company in Tally ERP 9. After making the enter your control automatically transfer to previous active company during working on Tally ERP 9. For eg: If you have two active companies first Dinesh & Company and second Deepak & sons. Now you want to make entry in Deepak & sons but active company is Dinesh & Company. In that situation you have to take following given steps. Step 1: First active the Tally ERP 9 software at your Desktop PC or Laptop. Step 2: By default first company “Dinesh & Company” automatically open in front of you when you active the Tally ERP 9 software. If you want to keep the first file then there is no issue. Press F1 shortcut key of Tally or click on the F1:Select Cmp option. This option open the list of existing companies. Select second company from the list eg: Deepak & Sons. 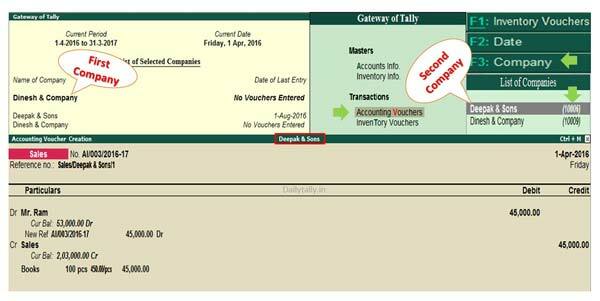 Step 3: If you want to make a voucher entry in Deepak & sons at the place of Dinesh & company then you have to open the sales voucher in which you want to make entry. GOT > Accounting Vouchers > To make entry in Sales voucher either click on the Sales Voucher or press F8 shortcut key to quickly active the sales voucher. Step 4: To make entry in Deepak & Sons Press F3 shortcut key or click on the F3: Company option from vertical button bar. Select the another company and save the entry. After saving the entry your control automatically transfer to previous active company. I hope after reading this guide all Tally ERP 9 users can easily switch from one to another company. After than you can easily record a transaction from one to another company in Tally ERP 9. If you have any suggestion regarding this guide then please write us in the comment box. Thanks to all.